Last week one of my softball coaches tagged me in a post celebrating our “Friend-iversary” of being connected on Facebook. As we drove to Great Falls last weekend to play in the Electric City Heat Classic I kept thinking about that post. It may seem so silly to most, to me I was feeling so grateful for the fact that he took the time to celebrate our social media connection but most importantly that someone who was there in my early years of life still plays a part in my world today, he’s a special man and so is his family… I hope that our little mighty team of Emerald’s have the same experience in the time they spend on the fields with the coaches who they get to play with. Last weekend, we took our 10U team to Great Falls without our fearless leader. Coach Beau stayed behind to be with family and friends to celebrate his God Daughters wedding. He had a tribe to rally in his absence, but I know sending his team of girls off without him was hard. 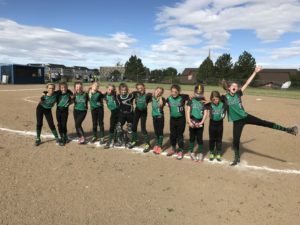 Starting off Saturday morning against the Billings Bombers, this mighty little team pulled ahead in the first inning by 7 runs and ended up winning out of the box 13-3. They would go on to win the next game against the Great Falls Select team and losing the 3rd game of the day to Cody’s Pride out of Wyoming. Shaking off the loss to Cody, the girls headed to the pool for pizza & giggles. They spent some time together just being girls and bonding, it was the eve of Mackenzie’s double digit birthday and Saturday’s performance seeded the girls #3 into the Gold Bracket for Sunday play. Sunday morning’s game was tough, the Great Falls team we faced came away with the win but it wasn’t without a lot of try and heart from our girls. What I love the most about this team is their resilience… they are gamers and they seem to rally and shake things off faster than most. It’s a really special combination, and I feel like its one of the things I love about watching them play together. Shoutouts to EVERY girl in the batters box last weekend. Madison brought in a double Saturday to seal a win, Ellie dropping a beautiful hit to the outfield to start off our game Sunday, Addison digging in and hitting away, girl you’ve got big things ahead! Taylor, Nakia, Kiera, Olivia, Kyleigh, Charolette and Mackenzie were hungry for the right ball and batted with heart. Seriously, I was SO SO SO proud of them… and I know everyone cheering from the sidelines were too! Rylee took at hard hit to her wrist playing 2nd base, she powered through by standing in the box to bat for her team and I know it took a lot of courage to do it. We were happiest to know she didn’t break anything during the play. These girls have GRIT. It’s hard to explain until you watch them come together and play. They have fun together, they compliment each other and like I said about Jaidyn, when they smile together they are unstoppable. Special thanks to Coach Dan for taking the lead in Beau’s absence. You did an amazing job with the girls and I am so very glad we had you to take charge. It was fun to watch you work with them and see your passion, I will never let Mack forget the “dance” on 2nd base when she should have been running to 3rd. It wasn’t funny at the time, but we will have that to laugh about for years to come! To Mike, Doc & Matt, thank you for helping Dan, it is fun to watch how each of you worked so differently with the girls. It takes a village and I really think we have a good one. To the parent’s, families (Siblings and Aunties included!!!) who were up at 5:30 am to get to the fields and cheer the girls on you are the special part in helping make the best memories for our team. I still feel so very lucky to be part of such a good group of people and giving our girls this opportunity to play together. The funniest thing about the weekend was the Gophers. Yes, Gophers. You haven’t played ball until you have been told that if a ball lands in a gopher hole do not touch it, it’s a dead ball. I thought they were joking until the gophers were looking for their homes Sunday am and running for their lives while we were doing our pre-game warm-ups. As we head off to our next tournament I’m so excited to watch them play. I love watching our team of mighty girls grow, and am grateful for the people who are making an impact on their lives each and every inning from the friendships being made in the dugout to the coaches I hope they have a lifetime of friendship made this summer.